Lexus enthusiast Tony Hawk jumps the company’s flagship supercar on his skateboard. Tony Hawk is a longtime Lexus owner and a fan of all things fast. "The Birdman" is a 14-time X Games medalist in skateboarding and one of the pioneers of the sport. He recently received a $375,000 LFA on loan and, of course, had to jump it with his skateboard. Hawk used the ramp to ollie the bright yellow supercar and completed the stunt with feet to spare. The Lexus LFA was loaned to him for his birthday weekend and looks stunning set in California. 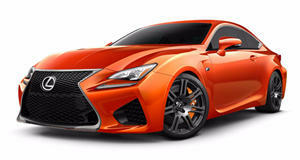 As a quick refresher, the Lexus LFA features a 552hp 4.8-liter V10 engine mated to a six-speed ASG gearbox. It can sprint from 0-60mph in 3.6 seconds and is capable of attaining a top speed of 202mph. Check out Tony Hawk&apos;s stunt in the clip below.